Timothy George, founding dean of Samford University’s Beeson Divinity School, was presented with a Festschrift April 24 during community worship in Andrew Gerow Hodges Chapel. The Festschrift honors his 30th year as dean and the 30th anniversary of the divinity school. 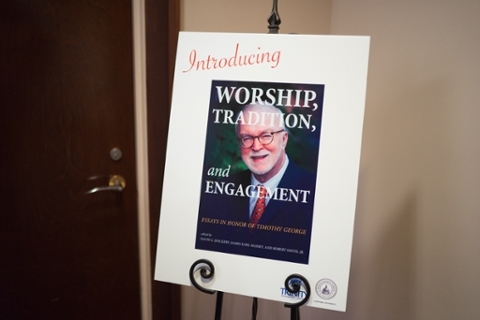 The Festschrift, an edited volume of essays published in honor of a scholar, is titled, Worship, Tradition, and Engagement: Essays in Honor of Timothy George and will be published by Pickwick Publishers this year. “Over these 30 years, this distinctive institution has been blessed with one leader since its inception,” said David S. Dockery, president of Trinity International University and coeditor of the Festschrift. “In 1988, Timothy George left his faculty position at Southern Baptist Theological Seminary at the age of 38 to respond to the invitation from Tom Corts, who was the president of Samford University at the time, to serve as the founding dean. Massey, who was unable to attend the chapel service, brought the idea of a Festschrift to Le-Ann Little, assistant to George, two years ago. Dockery, in a note read by Smith, said he regretted not being at the service but gave thanks to a more than 30-year-long friendship with George. “I have been blessed to learn much from this gifted scholar, theologian, historian, leader, churchman, and statesman over the years. For such a blessed friendship, I am forever grateful. George, upon receiving the Festschrift, said he was “totally flabbergasted” by the honor and at the same time grateful.